If you need some new Christian wallpaper as a background for your PC or Mac then Tim Challies may have the answer! 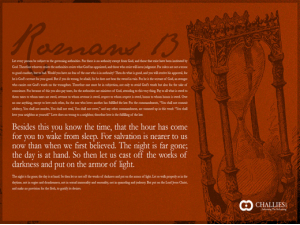 As part of his memorizing the scriptures series, Tim is producing a Christian wallpaper for the verses that are being covered. So far Romans 13 is provided but soon you will also be able to get Psalm 8, Psalm 103 and Romans 12. As you can see the Christian wallpaper background that Tim has produced of is a particularly high quality. Hey, only changed to aware about your blog site via Bing, determined that it must be seriously helpful. I am likely to be very careful to get belgium’s capital. We’ll love when you keep on this kind of later on. Other folks would be reaped the benefit through your creating. Regards! 24th Mar - Free Christian images from google!